COLUMBUS, OH, July 20, 2018 — Velosio, a leader in deploying business applications and cloud technology, has shot up to #7 on Bob Scott’s Top 100 VARs list for 2018 after a year of unprecedented growth and expansion into new markets. Bob Scott and the Top 100 VARs List has provided insight into the evolution of the mid-market software services space for nearly 30 years. In his roles as editor of Accounting Today, Accounting Technology and the Progressive Accountant, Bob has an exceptional understanding of this sector. Award recipients are selected based on financial performance during the previous 12 months. 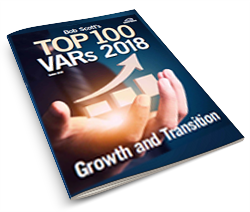 A special report that includes names of the organizations selected for this year’s Top 100 VARs list, ranked by revenue, is downloadable at http://www.bobscottsinsights.com. “This has been an exciting year to be a part of the Velosio family and making the Top 100 VARs list is another testament to the success that comes from building a truly client-centric business,” said Jeff Geisler, CEO of Velosio. “Every decision we make is weighed against our goal of creating a unique, positive experience and helping our clients realize genuine business value faster”. Velosio has received a number of awards in 2018, including Microsoft Dynamics Inner Circle, as a result of ongoing investments in cloud services, innovation in industry solutions and outstanding client experience. To learn about other awards, visit our blog at www.velosio.com/blog.